Crimewave's end ...what happened to make New York City change from being a frightening and dangerous place to live in the 60's, 70's and 80's to rather abruptly in 1990 begin a shift in under a decade and without a fight, become a safe, friendly and inviting place in the 00's?? coincided with a dramatic city wide cultural transformation change, starting from within New York's high crime communities as they lost cohesion for lack of recruits. Credit for the drop in crime, associated with the weakening drug cultures, tended to go to Mayor Giuliani, though his election occurred as the drop in crime was beginning to slow... three years after it dramatically started to speed up, in the summer of 1990.
great waves of social change set off by the replacement of old thinking by new thinking. 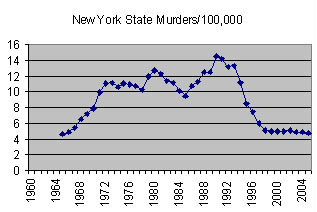 On Aug. 7 2005 I posted "A Quick Study" of this same history of murder rates in New York State. The relatively sudden and very final end to 'the great crimewave' that started with the ghetto uprisings in the 60's, is a dramatic example of dynamic cultural change. It began with a very public change of heart, that inner-city black youth, primarily, used their new freedoms to reject society, and after many tumultuous years ended in an almost completely silent, but equally dramatic change of heart to end it. 12/29/09The strong indicator that a cultural change occurred is the regular decay curve marking a shift from high and variable murder rates, to low and and completely flat rates, the collapse of the murder rate and beginning of a distinct period of quiet, that has now continued through 2009. That marks a clear 'change of state', and not the kind of thing caused by police pressure in a wild town like New York. 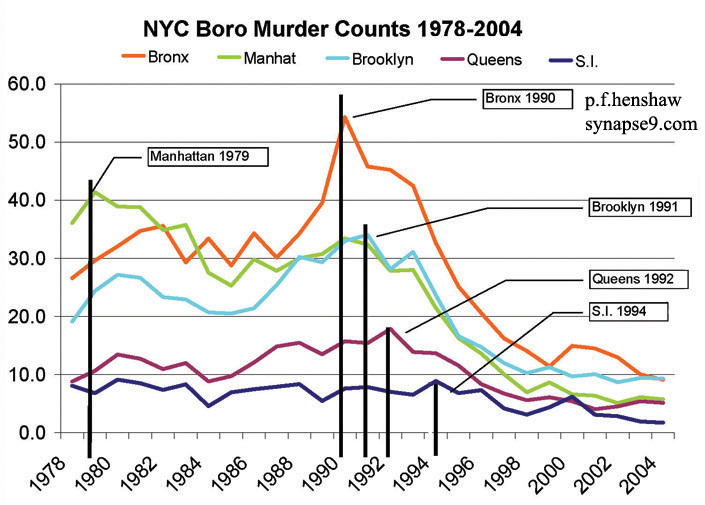 When you look closely at the data for each borough (below) it appears that in each one there was a specific intense crime spree that was "over the top" and tipped the balance causing each neighborhood to somewhat abruptly reject the virulent crime culture that raged in their midst at the time, and simply stop giving their sons and daughters to it. That's a little speculative, yes, but supported by many kinds of indications, including that the drop in crime rates that followed was as precipitous and permanent. It was as if at that peak moment the drug warriors the police kept sweeping off the streets endlessly, just abruptly stopped being replaced. That's the meaning of a rapid decay curve here, a distinct sudden absence of resupply. 02/23/08 Another 'sneaky' indication, is, well, that it was so sneaky. No one noticed it happening. There was even a notable mayor who came into office three years after the collapse began and claimed credit for the whole change of character in the city. There's really no outside factor yet identified, though, that matches the timing, or finality, of the change. There's no outside cause to explain the more or less sudden relief from a long persistent culture of violence which every possible effort was targeting to end for a great many years. In the various news accounts and studies I've read one of the odd consistencies is that no one seems to have asked the people involved what they thought happened. So I went out and did a number of interviews on the streets of Harlem and the Bronx to see if people remembered what it was. There may be other scientists who have done so, but I have not read about it. (http://www.synapse9.com/cw/cw_interview_notes_10-22_audio.pdf) The study was not meant to be exhaustive, and but to explore my method with a minimal amount of effort, to see if some better questions would come out of it. It certainly is only one data set, but does expose an unheard from inside point of view. I just handed out a blow-up of the curve asking "were you around here in the 90's", and "do you remember what happened here", leading people as little as I could until they offered something they remembered happening that they associated with it. The text file contains brief notes reflecting 50 good conversations with people, four audio file links, and my compilation of the reasons people gave. It's always great to get out and talk to people, and one rarely has something to ask them that is so central to their own lives and mysterious at the same time. Judge for yourself. Naturally I described what I could make sense of, introducing some of my own perceptions in the process, but I tried to just record the story tellers. Often the picture you see in a data set depends on how you aggregate the data. Among the questions that can't be answered from the Statewide data in the curve above, from a systems point of view, is whether every city in the state had the same trend as the aggregate (all of them together), and particularly whether the turning points for each city were at the same time, or in sequence. That would suggest or rule out several paths of causation. When I got more detailed data it came in the form of murder rates for each of the 75 precincts in NY City, and did not include those for the upstate cities, so that line of inquiry couldn't be followed. I then spent a lot of unproductive time looking at the citywide distribution of rates of all the precincts, and found all the patterns randomly scattered,... until I tried grouping the precincts by borough. Each borough had distinctly different behavior that was very readily visible and very consistent with my own understanding of their familiar social character. One might also ask, did I bias my findings by possibly asking the questions in a way that determined the answer I got? People do indeed commonly find what they're looking for because of that. Well, I found something like I was looking for, but I tried to be careful about that. I did push people to recall what was going on inside the their culture, asking about events without names, signs of change easily forgotten. From my own experience of living on West 96th street at the time I thought the turnaround might have had something to do with those amazing memorial murals that the 'wild style' graffiti artists made on handball court walls all over town for the families and friends of the victims of the street. I never guessed that when I asked people about that specifically they would remember but not give it much importance. It was such a dramatic and short term art action phenomenon (nicely recorded in "R.I.P. Memorial Wall Art") occurring seemingly just at the moment of the break. Now I think it was just one of a great many 'mirrors' of what was happening that a great many caring people and organizations began holding up for the people of the 'hoods' to see themselves in. It's a new perception actually, coming about three years after my interviews, about what the common element in a number of the provocative comments. That a huge sudden change in our local culture of such enormous importance would go essentially unnoticed is still the most amazing thing. It really took work to get people to remember what happened at all! In studying the borough murder rates another simple evidence of a culture wide event to end the crimewave is that all the boroughs show the same timing and kind of simple murder rate decay curve after their crack epidemic peaks. There are a number of puzzling things about the different times of peak murder rates. The Manhattan murder rate peak was were 10 years before the peak murder rates of the crack epidemic, for one. I haven't pursued the social change that meant violence in Manhattan did not increase with the crack epidemic as it did elsewhere. Derivative reconstruction is a time line smoothing routine that effectively assumes that local fluctuations are superimposed on larger ones, and 'looks for' a smooth way to thread through local fluctuation. 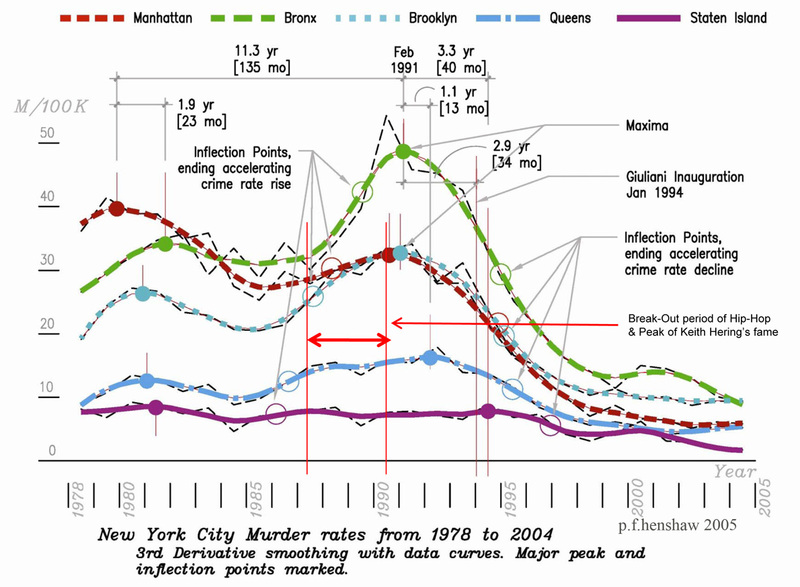 When the borough murder rate curves are smoothed using it, it is then possible to estimate the exact times when the inflection points of the underlying processes occurred. It's an assumption that bears validation. The inflection points of a transient social event seems reasonable to interpret in this case as the points at which the community response to the intrusion began to stabilize.. Part of the puzzle here is why did each higher crime borough show a later time of effective response (with the lowest crime borough, SI, seeming to be the first to effectively respond to the intrusion, as well as the one to continue its response the longest). 10/18/10 12/1 12/28/12 1/15/13 1/20 Then this year (Oct 2010) it occurred to me to do a study like I did for the emergence of the Sustainability discussion, and see if the number of articles in the NY Times year to year would show a connection between the the emergence of the Hip-Hop I was largely unaware of till the late 90's and graffiti wall art movement I had noticed in my neighborhood when living on West 96th street, exposed to the horror of the crack epidemic's peak by listening to frequent gunfire outside my bedroom window at night. What I found is summed up in the third graph below, that the explosive emergence of Hip-Hop within the scene, quite below nearly everyone's radar, does seem to exactly coincide with the sudden reversal in the direction of change experienced throughout the whole city. Just as Hip-Hop emerged as definable culture and art form in its initial explosion from 1988 to 91, the great crime culture that arose in the ghettos of the 1960's lost it's attraction, for lots of good reasons that never worked before. The whole city abruptly stopped resupplying it with new recruits, is what rapid decay curve in the data suggests. Consistent with what the people I interviewed were saying, all the previously ineffective ways of bringing the crime culture to an end suddenly started to work, and drained of vitality it simply faded away. Still, for a turn of events as dramatic as that, it's amazing that no one noticed. The first appearance of Hip-Hop on the New York scene in 1983, was followed by an explosive emergence as a major force in the culture from 1988 to 1991. That was marked by a doubling in the number of articles in the NY Times, in 1988 & 90. That period also coincided with the final peak of the crack epidemic, intense law enforcement, religious, social activism and education efforts, the brief period of Wild Style graffiti wall art murals dedicated in every borough and height of Keith Haring’s fame and death, among other things. 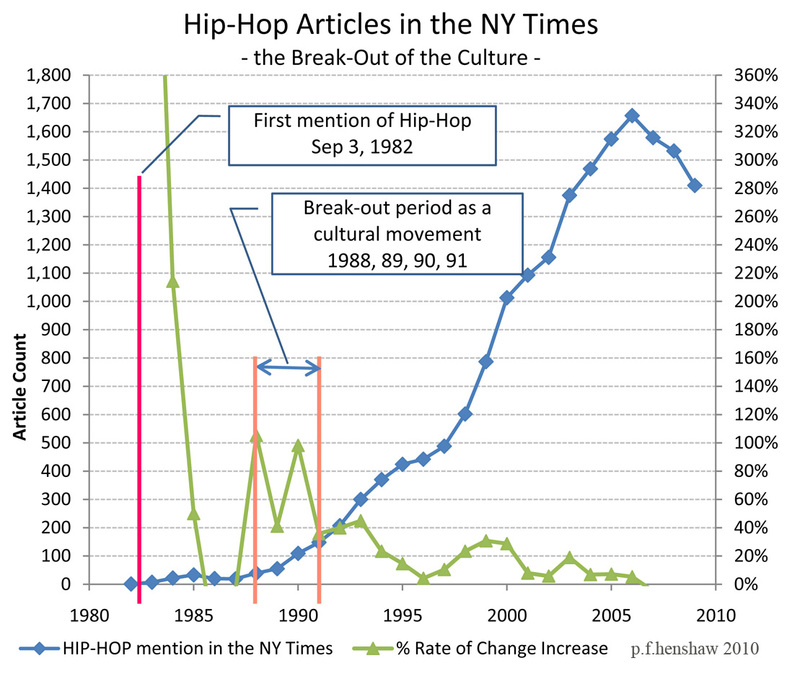 At the end of that emergence of Hip-Hop, as a major scene in its own right, its growth in the wider culture got increasing attention in a series of bursts of attention (seen as smaller waves in the % change curve), and reached a peak and starting to decline in the interest of the NY Times in 2008. It looks as if the whole society's desperation to find some escape from the Crack Culture that had enthralled the underemployed youth of New York's poor neighborhoods, filling the prisons and morgues with its victims, needed and found a spark of alternative ways of living from Hip-Hop, and energized Hip-Hop in the process. It seems like a good explanation for why the murder rate curve looks as if the culture suddenly just stopped giving any more of its young to the world of crack, and ALL the measures to fight it suddenly started to work. It's amazing, but in the many interviews I did not a single person mentioned it, that the kids found something new to do of their own invention. A further irony, of course, is that the underground movement that gave birth to Hip-Hop seems to have been the community of graffiti artists who's main mission in life seemed to be to deface anything reachable in NYC with bold displays of their signature graphics, saying "me me me" as a 'rude' statement to the world... but an apparently profound claim to self-identity too. That, of course, was the 'misbehavior' the "broken windows" theory of policing often credited with the turn around was aimed at suppressing. It seems lucky it didn't. One can't leave out an observation in Freak-o-Nomics (chapter 4), of a curious coincidence between the 1973 date of the Roe V. Wade decision making adoption legal and the precipitous drop of murder rates in New York, especially, but also around the country. Their idea was that women were suddenly freed from having unwanted children, and could give birth only to children they could and wanted to care for. That cohort of "wanted children" it was speculated, might change the youth cultural some 17 years later, as the data on the sudden collapse of New York City's endemic drug culture during the 90's does clearly show. Recently a seemingly quite good article in Mother Jones, "America's Real Criminal Element: Lead" made the case the same way, but in this case saying the cause leading to the effect was that environmental lead began to be reduced in the 1970's, and changing. The reasoning for both, however, relies on the overly simplistic "billiard ball theory" of cause and effect for complex systems. A great deal more than just a single supreme court decision or a single environmental policy happened in the early 1970's. There was a genuine sea change in the attitudes of Americans towards each other, their environment, their children, a true cultural revolution. It extended around the world in fact, as an outgrowth of wealth, technology and the new lifestyles made possible by it. The Roe V Wade decision. and the reduction of lead poisoning are just good anecdotal examples of the kinds of dramatic change that came from the 70's. How unaware we are of that big change in American culture, as if taking it for granted, is evident in our not having a name for it. All there seems to be is a name for the instigating cultural change, the so called "counter culture" of the 60's, as a wave of ultra idealistic youthful thinking and life-style change, for peace, personal freedom, tolerance, respect for the earth, delight in free expression and cool technology. It unarguably caused a cascade of cultural and institutional changes of many kinds. That was, of course, what brought about the Roe V Wade decision itself. It was also what brought about the elimination of lead from the environment, too. What isn't explained at all by single cause evidence is why it was only in NY City that the long established culture of drug violence began to decline so abruptly, and continued to so steadily for years as if of its own accord. There's no evident effect three years later on the shape of the curve for the Giuliani administration, usually discussed as the cause in urban lore. What's also really missing is why the anecdotal associations don't correlate with a reason for why the effect was most dramatically seen in the behavior of NY kids, as if they were where it was happening... It also doesn't explain why 1990 doesn't seem to have been a watershed year for other equally dramatic changes, as would be implied if they had dramatic effect on the youth who had entering the criminal drug cultures at that time. That's the question I was following when I noticed coincident movements in NY youth culture, the emergence of Hip-Hop and proliferation of memorial wall art, youth and families suddenly starting make great statements celebrating their friends who were victims of the crack culture. Both of those displaying a great change of heart right at the turning point, and at the heart of the culture most effected. It stands more study, but just the data itself really reads as if reflecting a dramatic local cultural change. Maybe it was, a dramatic cultural change in the youth culture of NY City, that was picked up a bit less dramatically elsewhere, as with so many other cultural events, a viral process with a definite place of beginning and cultural heart. You might say that kids born in the 70's would have grown up taught to be more more respectful, more validated as individuals, more free to think for themselves than their older peers, and stuck in the same old ruts and able to do things differently, as we do generally observe throughout our society. It seems the kids of the 70's born in the New York's ghettos were very clearly so. So, there appears to have been a "dramatic change in a culture of violence, that went entirely unnoticed", within the high crime communities of NY. That it went unnoticed, and remains undiscussed in 2013, with all the debate over the national culture of gun violence in the US, indicates our general understanding of natural change is "missing something". It displays our being unaware of a totally natural way for whole cultures to go through dramatic change, one that we still don't know how to recognize or discuss, or promote. "R.I.P. Memorial Wall Art" Cooper & Sciorra, Henry Hot and Co.